True ownership of one share of Nintendo stock framed like you want. 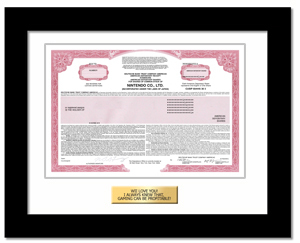 The recipient becomes a real shareholder of the company. Manufacturer of the Wii- Nintendo stock is a popular gift for gamers. The Nintendo share certificate represents a snapshot of history. Get yours while you can because in the not too distant future, the industry will eliminate physical stock certificates making these valuable collectibles. Nintendo is the oldest intact company in the video game console market and one of the largest and well-known console manufacturers. Nintendo is famous for it's Game Boy, Game Cube, Nintendo DS, and Wii consoles.